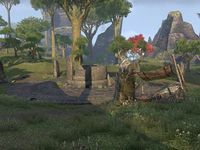 Iluvamir Dolmen is a Dark Anchor spawn point northwest of Vulkhel Guard in southern Auridon. Prior to Update 9, this dolmen and its associated region were named Lluvamir. This page was last modified on 21 July 2017, at 16:04.